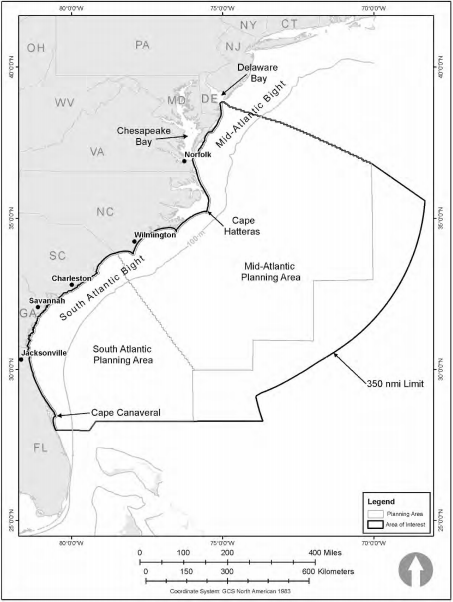 On Friday, the National Marine Fisheries Service (NMFS) approved a plan to make it legal for five companies to conduct seismic testing off the Atlantic coast, in an area stretching from Delaware to Florida. The seismic testing is an initial step toward leasing federal offshore waters to oil companies that may want to drill there. In January, the Trump Administration opened up more than 90 percent of the federal offshore area to potential lease sales. Individual states largely oppose offshore drilling, fearing that another Deepwater Horizon disaster could ruin their tourism economies. But because state waters end three miles off the coast and federal waters aren’t subject to state rules, states have found themselves trying to negotiate with a mercurial federal government. Florida received an exemption from lease sales from the Interior Department (at least until 2022, when a federal moratorium on drilling is lifted). But New Jersey hasn’t, and the state has sued the Interior Department to find out why. The area approved for seismic testing. The companies that have been approved to conduct the seismic testing are Ion GeoVentures, Spectrum Geo Inc, TGS-NOPEC Geophysical Company, WesternGeco, and CGG. All the governors of states adjacent to the federal waters outlined in the map above oppose offshore drilling off their state waters, according to the Washington Post. Just last week, the US Geological Survey released a study saying that fossil fuels from federal lands (including offshore oil drilling) contribute to nearly a quarter of the US’ carbon emissions. According to the Post, one 2014 model prediction by the federal Bureau of Ocean Energy Management found that “nearly 2.5 million dolphins would be harassed or possibly killed by acoustic sound blasts each year in the middle and southern Atlantic, and nearly a half-million pilot whales would be affected.” The endangered North American Right Whale is also an inhabitant of the area. Moving forward with offshore oil drilling reverses action by the Obama Administration, which declared Atlantic waters off-limits for oil exploration.